I lauded them for their work. who had been honored for her service. he said to me, “until I heard your talk. who is unable to walk. lifting him and carrying him often. while the father works nearby. 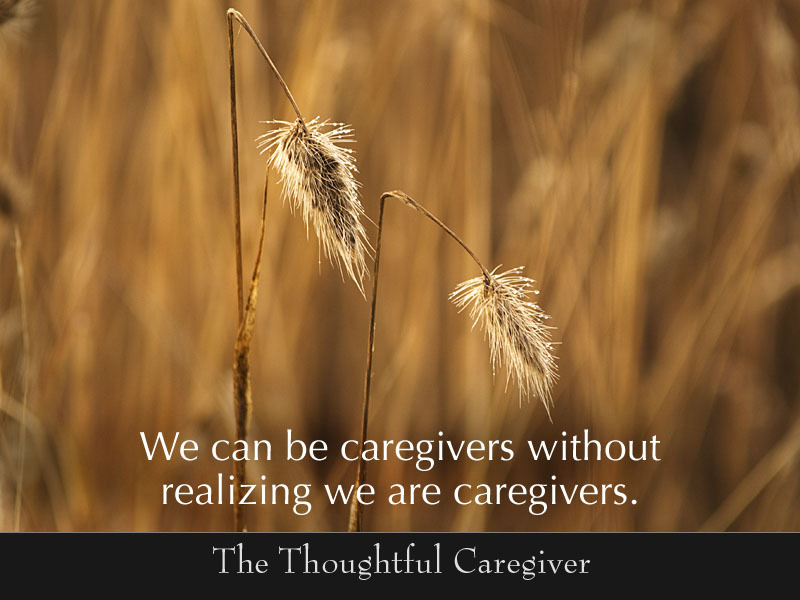 we may not see ourselves as true caregivers. we may not validate ourselves. 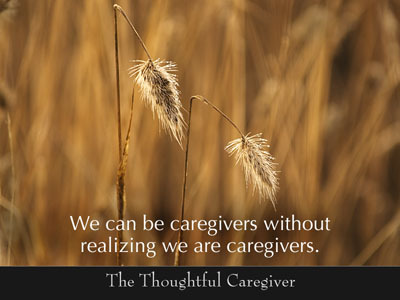 we can still be true caregivers. we can still do strong work. we are still giving care and spreading care. to the universe at large. but that time is approaching. “It’s been hard,” she said. “I wonder what the future will bring. can bring me to tears. wrote those wise and comforting words. for several years before she died in 1866.
and hide from the future. to what is within our control. small as they might be? just as these moments come to us? what seems so formidable to consider? if not some sense of joy? if we would take the time to look around us? if we’re going to be honest with the world? no matter what’s standing before us? These are no small matters at all. They are our grand business. in his assisted care facility. something he can no longer do for himself. “Boy, my toenails need it too,” he said. while I sat on the floor before him. wanting to be sure that I didn’t hurt him. “No, I didn’t mind at all. In fact, I found it very meaningful. But I know how I felt. able to do something that Dad needed. to do this personal act for him. and tended those stubborn nails. and is now showing that strength in other ways. Except it wasn’t a chore at all. It was a contented act of love. Perhaps you know that experience too. a novel by Kent Haruf. in a small Texas town. a conscientious, quiet, 11-year-old boy. DJ never knew his father. His mother died when he was four. in a tiny, run-down house. never seems to resent all he must do. since I finished the book. and new ones I’m continually meeting. because it’s what life has handed them. be doing something very different. often under less than ideal circumstances. let alone praise or acclaim. is the kind thing to do. and was ready for a third. to go slower than is our inclination. 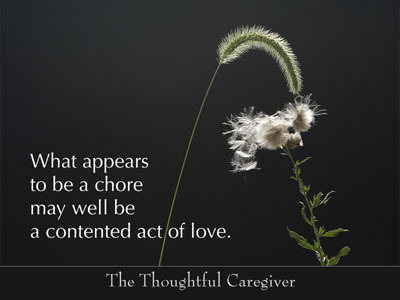 than the one we commonly use. and how quickly they can do it. 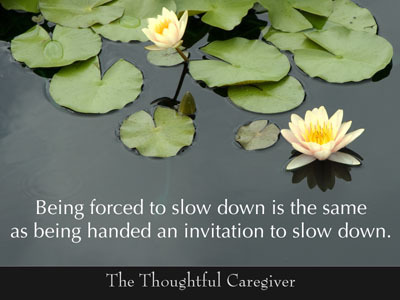 and therefore slows us down. of impatience, of pushing to go faster. has its benefits, its gifts? If that is true, why not sample these? to see and hear, to touch and enjoy? If that is true, what is stopping us? may prevent us from learning? then will we open ourselves or not? to move at the pace we dictate? She’s been bedfast since 1999. A full-time aide comes five days a week. Richard is her hands-on caregiver. it’s all his to handle. I asked him how the experience has gone. “The first two years were very hard,” he said. “I was exhausted and exasperated. back and forth, day after day. I felt trapped between the two. 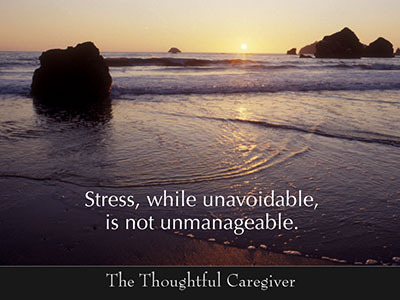 all the ways caregiving can cause stress. We know it already, deep inside. The question is this: what will we do about it? affect all of us differently. and ideally also to someone we trust. some relief, some healing hope. realizing we must take the lead ourselves. We cannot expect others to solve this for us. with gratitude and with grace. “I went to a therapist,” he replied. “One session was all it took. because I felt so badly for June. 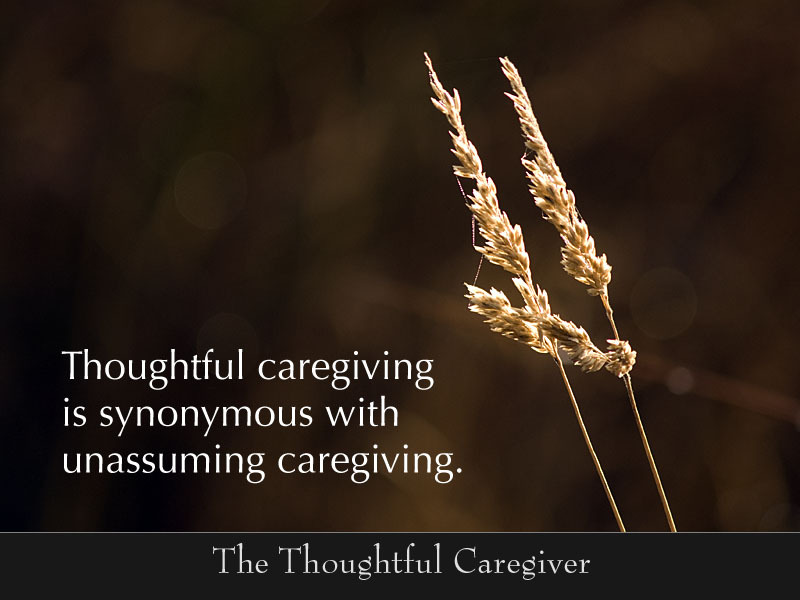 and part of my days taking care of me. just as long as we can. she had terminal pancreatic cancer. 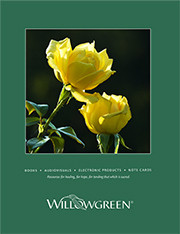 Signs of Life: A Memoir of Dying and Discovery. 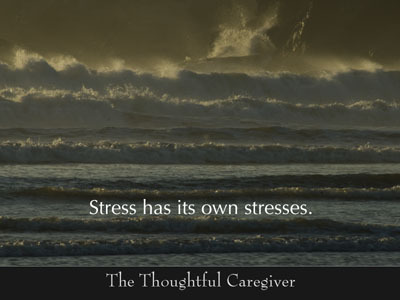 such care can be stress-producing. to pay attention, to carry on normally in life. “I had no idea it was there,” he confesses. stress is not necessarily bad for us. can make life interesting, even exciting. then it’s likely not so good for us. going on longer than we wish. can negatively affect one’s physical health. 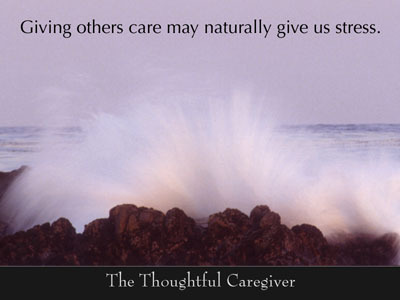 who care for family members with Alzheimer’s. that influenced how their bodies aged. 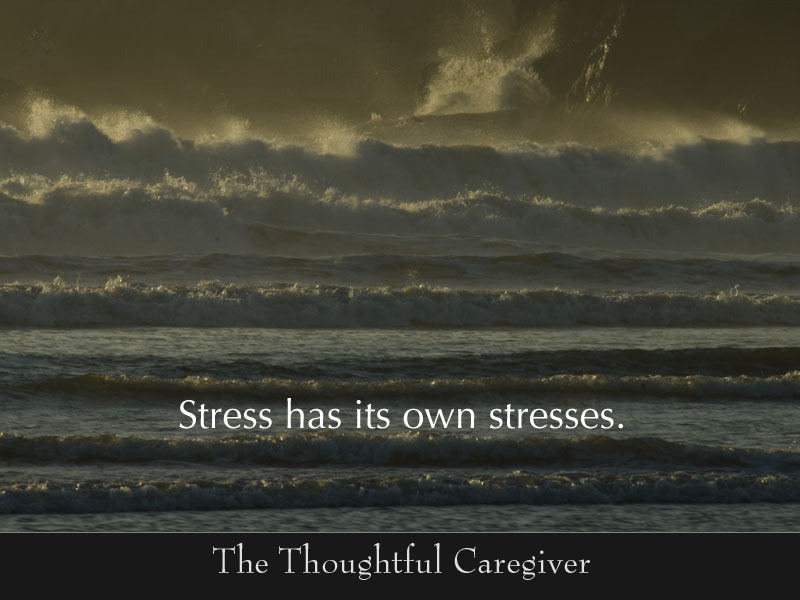 too much caregiver stress is not good for us. 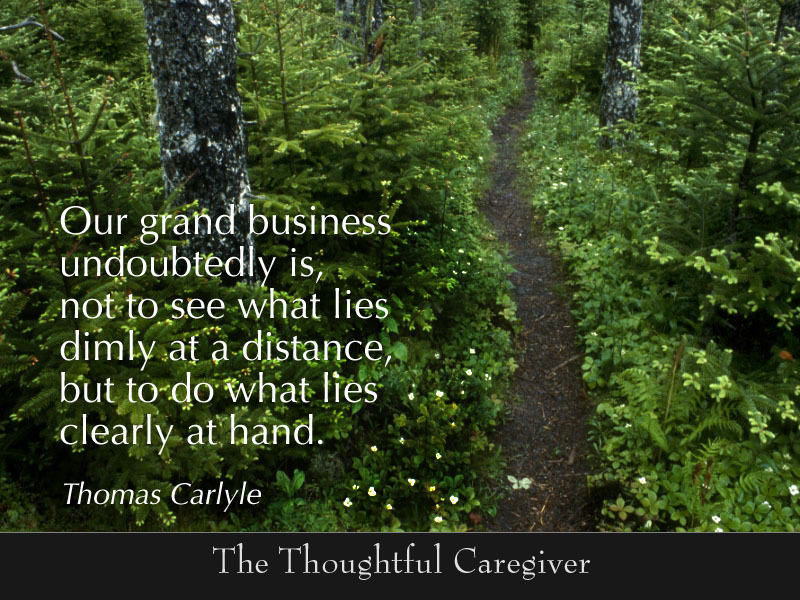 neither is it good for the one in our care. We’re too closely linked for that to be otherwise. I hesitated to write about this study. to worry about, to stew over. that they need to be shared. to ameliorate the effects of such stress. let’s monitor our levels of stress. That’s a beginning step we can take. Mary went to get his prescriptions filled. While waiting for these, she did some other shopping. or we may have learned it long before now. 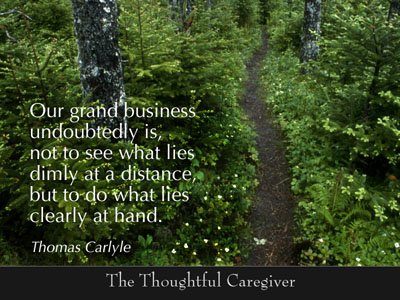 about what the one in our care must endure. wondering if we can do what’s asked of us. by what we’re continuing to go through. not fully aware of how stressed we are. who has really done nothing wrong. that refuses to go away. That’s how stress works, in all of us. more than that, deserves an avenue of expression. at the nearby grocery store.